Let me start off this letter with an admission: when you were first born, I was very concerned that you were “normal.” From counting your fingers and toes at birth to comparing your weight gain and sleeping habits with other babies your age, the question I kept coming back to was, “Is this normal?” Because I wanted you to be okay, you know? I wasn’t looking for hints of a baby Einstein; I just wanted kids who were normal. Maybe it’s because I’ve never felt quite normal myself. I’ve always felt a little “too much”: too sensitive, too intense, too quiet, too weird. And as an introvert, I didn’t want to feel that way–I would have rather died than stick out in any way. So those moments where I felt like I really fit in–where I dressed like everyone else and acted like everyone else–well, I cherished those times. It was nice to feel normal. And even as I’ve raised you past infancy into full-blown kid-dom, I’ve always kept a close eye on “normal.” When we decided to homeschool almost two years ago, one of my biggest hesitations was that we were setting sail from “Normal.” I was scared, frankly, that, quarantined with myself–whom I know to be weird–you would turn out to be most decidedly “not normal.” And you know what? I was right. 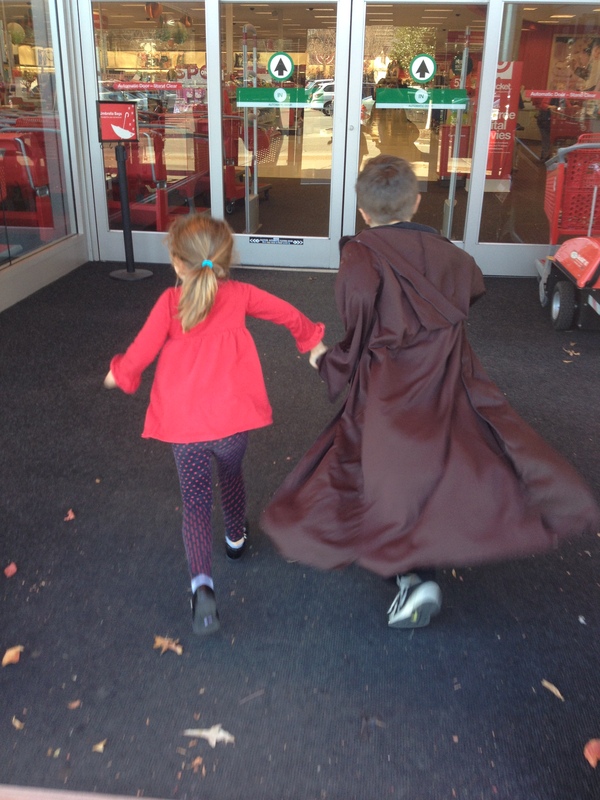 Holding hands…cloak and all. Bless it. And you know, just to keep it extra real, there are some areas in which it would behoove you to conform just a little more to the patterns set forth by society. For instance, if you could stop eating like baboons and perhaps start making consistent eye contact with people who are talking to you, that would be fantastic and helpful for your life. No worries, though. It will come with time. And when it does, it might also come with a dawning awareness of larger society and how it functions. Table manners and people skills will perhaps correspond with a growing self-consciousness, and suddenly, there will be pressure: the pressure to be normal. To like the things that other people like. To pursue the things that other people pursue. To talk and think and act like everyone else. I get it, I do. I’ve already told you that I have felt it myself. It’s funny, though–the more I’ve grown, the more I’ve decided that normal is not all it’s cracked up to be. In fact, I’ve decided that God does not make “normal” people; “normal” is what we slide into to protect ourselves, or to let ourselves off the hook from truly living. See, the “normal” life is largely unexamined (and you know what Socrates says about that). “Normal” doesn’t question its purpose, doesn’t ponder why it’s here. It just is. The “normal” life is unoriginal. It follows well-trodden paths and always looks to others for its cues. It’s faintly institutional. It conforms to the template of existence set out by its place and station in life. Normal lacks vision. It’s more concerned with whatever is in front of its face at the moment. In that sense, normal is largely materialistic. I pray everyday that you become the people that God designed you to be, and more and more, I see Normal as an obstacle to that prayer: both a distraction and a temptation. And that’s why I’ve decided that you guys can be the weirdest kids in the world, and I wouldn’t care a bit. I wouldn’t want you to lose your ability to relate to others, of course, because relationships are a big part of a full, rich life…but may God spare you from the curse of “cool.” Obviously, it’s not about being weird for weird’s sake; rather, my hope is that you don’t ignore the God-given possibilities for your life in order to fit in to society’s mold. God did not create you “normal.” He created you beautifully unique, with unique gifts. And the sky is the limit for how you use them. Be passionate–explore your interests, and pursue your curiosities. Do you want to learn to cook? To quilt? To orate? Do you want to write computer code? To learn French or how to fish? Do you want to make beautiful music or express yourselves through the written word? To learn about what makes people think and how to truly listen to them? To be a missionary? To travel the world? Then, let’s chase after those things–I’ll do everything I can to help you learn and to be whatever it is that God has put in your heart. And then my prayer is that you do it with gusto! (Also, we may have to win the lottery for that world-traveling thing. But we’ll do what we can.) But even more than pursuing those things that set your heart on fire, I hope that you will do them in a way that helps others–that blesses this world. See, Normal tends to think of inner passion in terms of personal fulfillment, a mindset that overlooks the fact that you truly are God’s gifts to the world. He gave you your passions and talents so that you can use them to show His love to others. That’s why I pray that you look to Him–and not all around you to what other people are doing–when you decide how to bestow those gifts. Because society will probably tell you to be Normal. When you, dear children, are anything but. Really great post! As an introvert and someone who is also “abnormal” in various ways, it took me all the way to my late 30’s to finally feel comfortable with who I am as a person. It has been so freeing! Thanks, Laura! It’s definitely been a work in progress for me, too, and you’re right–each step has truly been a step toward freedom! “God does not make ‘normal’ people” – what a comfort! This has to be one of the best parenting posts I’ve ever read, Kim. Raising our kids to be society’s idea of normal is setting the bar way too low. God offers us life in Christ, for crying out loud! Thanks for bringing your family to us in this post, Kim. I’ll be tweeting a link back here for others to follow. Thanks so much, Tim! And congrats on the shout-out from RHE yesterday:). I smiled when I clicked the link and found myself looking at your blog! That was a nice surprise, Kim. Marlena’s piece was a welcome addition to what is becoming a long line of great guest posts, yours included! So true, Bronwyn! And costumes have been a big part of my kids’ lives, as well. It’s gotten to the point where I won’t even notice that Anna has on a princess dress or Luke has on Obi Wan’s cloak (as in the picture above) until we are already out and about:). Thanks for sharing your thoughts! Beautifully written, Kim…as always! Luke and Anna are so very blessed to have you as their mother. Your post has inspired me to look at myself and my own family. Its amazing how caught up we can get in the normal game of life and not even realize it. Thanks for the inspiration and wisdom! Tara–I hear you! The pressure to slide into “Normal” is so strong, even when you make specific lifestyle decisions to combat it. The Normal that we keep sliding into is super-busy and materialistic. I feel like I’m always having to pull back the reins on our family life and redirect our trajectory. Because truly, the kids and I do not do well when we are super-busy. Some people love it, but God did not make our family for that pace of life! :) So that’s a way that we still struggle with getting pulled into “Normal.” I think that’s also what I mean when I say that Normal is “unexamined.” I feel like I constantly have to be examining our life and making sure that it lives up to the goals we have set for ourselves. Like I said, it’s so easy to slide back into Normal. Thanks so much for adding your thoughts–and for the kind words! Thank you so much, Melanie–you have no idea how much that means to me. I really appreciate you taking the time to be an encouragement. Like I said, it just means a lot…. I loved it, Mel! One of my favorite posts was about the shows we watch. Definitely convicting. One of the verses you used, Ephesians 5:16, is one of my favorites. Thanks for being willing to open yourself up and share your thoughts. Good stuff!